The weather the last few weeks has been a roller coaster - temperatures ranging from well above normal to below normal, light snow, hard deep freezes, then warm winds from the south and rain. Yesterday it was in the low 20s and today the dusting of snow on the ground is melting off, though the ground remains frozen. After a couple more warm days, the temperatures are forecast to plunge below zero next week. The temperature may not be consistent, but one thing has been consistent this year in Vermont. It has been WET. This year has seen the most precipitation Vermont has experienced in a very long time, and in many parts of Vermont this has been the wettest year on record. Happy Holidays! I hope everyone who is reading this is enjoying their holiday season. White Christmases are in short supply this year, and New England is no exception - only the higher ground has any significant snow. The Interior West is socked in with cold and snow, but Vermont is expecting yet another rainy, slushy, icy mess tomorrow. Burlington is expected to pick up enough rain and wet snow to make this the wettest year on record... and the same is true for most of the rest of Vermont. 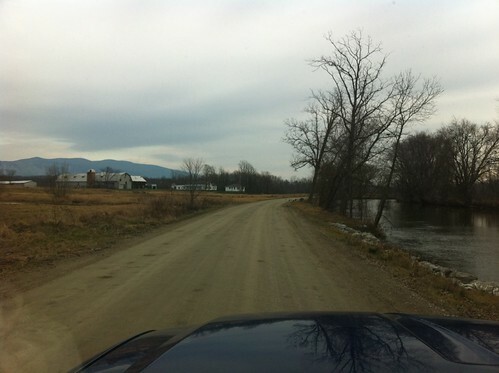 It's been an eventful year for watershed issues in Vermont, especially during and after Hurricane Irene, but also with heavy spring melt floods in many areas. However, so far this winter it has not been a good year for one of my favorite side projects - using food coloring to color icicles. 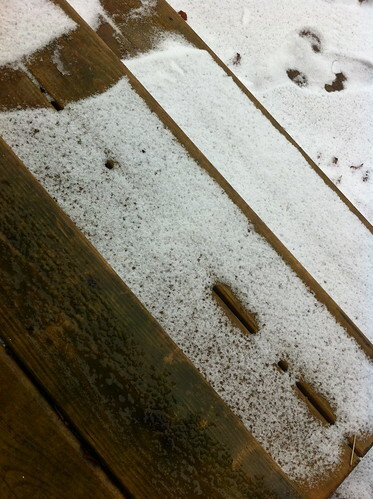 It's been quite cold at times, but the storms have come with warm air and brought mostly rain and few icicles. Still, I've managed to find a few to color. Yesterday was a rainy day, as forecast, and as anticipated (dreaded?) in my last post. It went about as forecast - some icing and freezing rain in the morning, followed by surprisingly heavy rain, for this time of year at least, that lasted several hours. 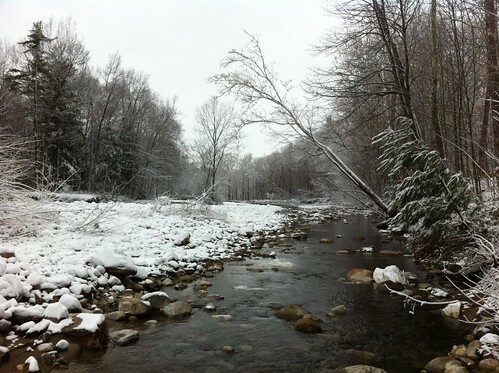 The headwaters of the Middlebury River picked up more than half an inch of rain - which would be insubstantial for a summer thunderstorm, but is rather unusual for late December. Much of the ground was frozen, and the water ran off fast. The river is running high right now. As i expected, most of the ice in the river was ripped out. 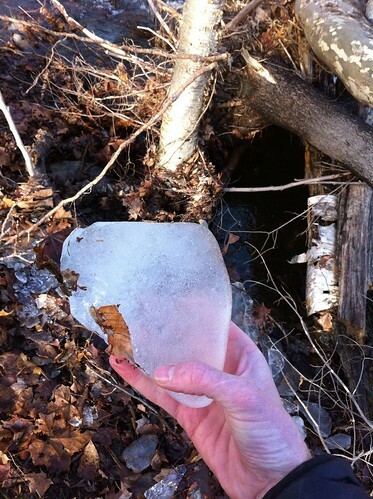 What I did not expect was to find piles of ice, rounded like river cobbles, laying where the high water left it. Ice is lighter than liquid water, of course, but quite hard. I suspect that a combination of melting and smashing against rocks and other ice created these ice chunks... melting alone often accentuates corners rather than smoothing them. We have a metal roof and I woke up in the middle of the night to the tapping and plopping of raindrops. My heart sank a little bit. Seeing those words on this blog are a bit of a surprise, really. For most of my 'previous' life in southern California, waking up to December rain would have brought excitement and anticipation. Essential life-giving water, absent for much of the year, was being poured into the hills and canyons. In California, rain means green hills that later erupt in a rainbow of flower colors... silent, cobble-strewn creekbeds again filled with the rush of bubbling water, a temporary but impeccable cleanness to the air. Winter rain in California brings life. 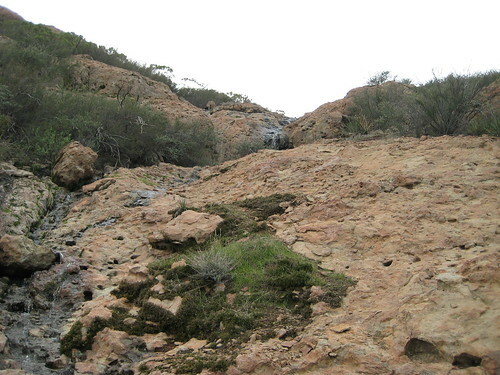 After a winter rain on Boney Ridge in southern California, every dip and gully in these rocks is filled with tiny streams. A few days after the rain, they are again dry. 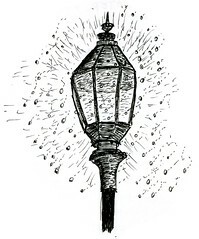 It's hard to be excited about winter rain in Vermont, though. Snowless fields and overcast skies in Vermont - the crows appreciate the bare mud as their food is not buried in the snow. I've recently become rather addicted to Minecraft, a computer game with a highly modified world of blocks of different types that you can modify and move to build structures and search for resources in an effort to survive. 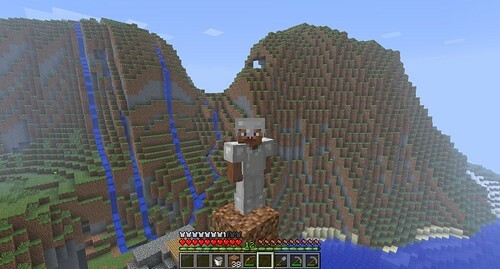 By day (for about 10 minutes) you can wander the huge, complex, randomly generated world, gather resources, cut and plant trees and crops, and explore, but for the 10 minute night zombies and other monsters emerge and you must retreat to your fortress or go underground to mine for minerals. When I first started playing this game, my friend told me that I'd probably really enjoy it, except for how the water works. He's right - modeling water flow is incredibly complex, and it doesn't make sense for a game like this to try to develop a realistic model as it would be a huge drain on computing power. To someone like me obsessed with water flow, the way water is modeled is silly and a bit frustrating - but not enough so to detract from the enjoyment of the game. It's been an unusually warm late fall, but cold weather is still making its way into Vermont, albeit not as quickly as it did last year. 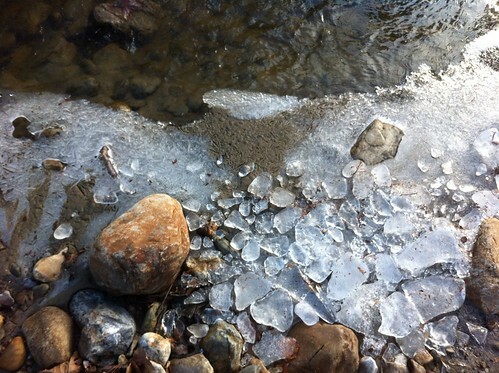 I've been out watching the seasons change and enjoying the patterns made by snow and ice along the river. There are lots of things going on right now in the world of water, so I'm going to address a few subjects here. Much of Vermont got some snow last night - only an inch or two here, more in the mountains and points east. It's already snowed twice, but both times it quickly melted due to warm temperatures associated with the unusually warm fall. It's supposed to be much colder now, though not unusually cold, which means the snow should stick around a bit longer. We have some other chances of light snow in the forecast, but nothing major. 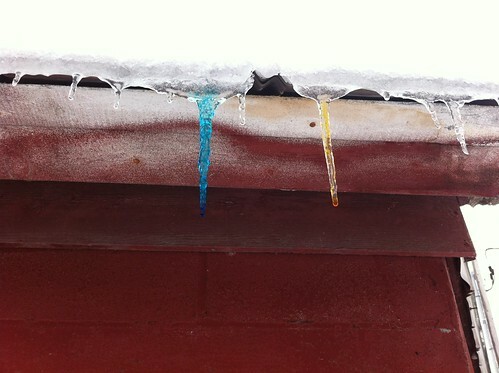 Some small icicles have formed, and I already colored a few of them (see here for colored icicle photos from last year). In any event if the choice is between the giant swimming pool and even larger constructed wetland and a polluted river, I'd take the former, of course. Finally, the still-active Opportunity rover has found a vein of calcite on Mars! The only known method for calcite vein formation is liquid water moving through rocks, and this is almost certainly proof of liquid water being present and moving through rocks on Mars in the past. Calcite veins are common on Earth, where liquid water is of course quite abundant. Vermont has had a warm fall, but winter is coming. Cold rain and wet snow are in the forecast for this week, with much colder temperatures a near certainty later in the month. With a weak economy, rising fossil fuel prices, and reductions in federal heating aid, many poor Vermonters are uncertain how they will survive the winter. Heating oil, used by many to heat their homes, is increasingly expensive and unlikely to get cheaper any time soon. Meanwhile, many of the forests in Vermont, especially young woodlands that are growing in abandoned fields, have become heavily infested with introduced plants such as glossy buckthorn and common buckthorn. These invasive plants, which I've talked about before and even made a little video game about, have few or no natural predators. 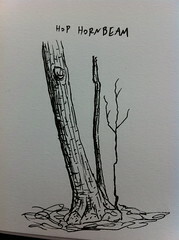 For this reason it forms dense thickets in open areas and stops trees like maples from returning to these areas. While the long term effects are uncertain, at the current time we are seeing the formation of thickets of buckthorn with little other plant life. Removing buckthorn has been shown to allow tree saplings to grow, but removal can be expensive and money is in short supply right now. 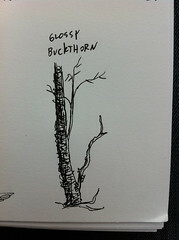 There is a movement to reduce the numbers of invasive species by eating them, but buckthorn isn't edible. 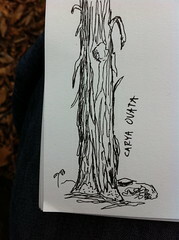 Even the beavers don't seem to like it. Most landowners and land managers don't like it either, but can't afford to remove it themselves. While testing out a citizen science iPhone app called What's Invasive, I mapped some of the buckthorn in the Champlain Valley area. This map is by no means complete, and simply represents places I've seen buckthorn when testing the app. Go to the main website linked above and select the 'Champlain Valley of Vermont' park for more info and photos. Winter is trying to build in to Vermont and displace the second warmest fall on record. There is a chance of snow squalls today, perhaps mixed with rain, and tonight the temperatures will plunge to the teens and low 20s. The battle with the warmth isn't over yet, though. It will warm up a bit by the end of the weekend, and the forecast is for a VERY SLOW MOVING cold front to pass over the area over the next few days, bringing rain, becoming colder and colder and colder until the rain is BARELY not snow. Then, we may get a quick inch or two of snow and hopefully the storm will be gone. Maybe by the time it leaves we will have set the record for the wettest Vermont year on record too.